Is calling to follow up after a job interview a good idea? If you do decide to make a phone call, what should you say? Job seekers are often hesitant to call to follow up after a job interview. It's natural to wonder if you are bugging the interviewer and whether a phone call will help or hinder your chances of getting a second interview, or even a job offer. Should you—or shouldn't you—take the time to call after a job interview? Following up with an email is always an option, of course, but calling may get you directly in touch with the hiring manager. It shows that you've taken a little extra initiative. It will also give you an opportunity to make your case one more time. How Do HR Managers Like to Be Contacted? 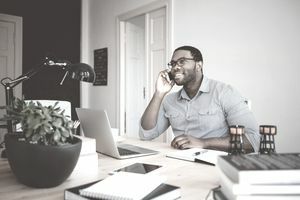 A survey from Accountemps should put your mind at ease, since it found that human resources (HR) managers list a phone call as one of their preferred means of communications from candidates. The first three options are the best ones—interviewers and human resources managers prefer a handwritten or emailed thank-you note or a phone call. Texting obviously doesn't cut it. It's also best to avoid sending messages through social media. Human resources managers or potential bosses are not your Facebook friends. If you were already communicating through LinkedIn, however, sending a message there is appropriate. Whatever form your follow-up takes, it needs to be as professional as you were during your job interview. A phone call is a quick and easy way to follow up. In addition, it's more personal than a thank-you email message or a thank-you note, even though those also work well. You're connecting personally with the person who may be making the decision to hire you, or who will at least have some influence on that decision. At the least, it reminds the interviewer of your candidacy. At best, it can help you secure a second interview or even a job offer. Call your interviewer directly, ideally within 24 hours of your interview. If you get voicemail the first time you try, you don't need to leave a message. Try again and see if you can catch your contact in an available moment by phone. Early or late in the day works best, because people are less likely to be in meetings or interviews then. Hi, Mr. Jones! This is Mary Burns calling. I interviewed yesterday for the Associate Marketing Coordinator position, and wanted to thank you for taking the time to meet with me. I so enjoyed our conversation—please don't hesitate to get in touch if there's any additional information I can provide. You can reach me at 555-555-5555. Thanks again, and I hope to hear from you soon. If you reach the interviewer, first of all, good for you. Many people screen all their calls these days. Be brief and to the point, thank the hiring manager for his or her time, recap your qualifications, then ask if there is anything else the interviewer would like to know. Finally, ask whether there is any further information on your background or experience you can provide. If there was anything you wish you had mentioned during the interview but didn't, take this opportunity to share it with the person who interviewed you. Be prepared. Have a copy of your resume in front of you when you call. That way, you'll be ready to answer questions if the interviewer has any. This will also help you avoid rambling or feeling flustered during the phone call. Practice. If you're nervous about calling, and that's entirely understandable, practice. Ask a friend or family member to pretend they are the hiring manager and make a couple of calls. The more you say it, the easier the conversation will be when it's for real. Call the decision-maker. Be sure to get the interviewer's business card at the end of the interview if you don't already have a phone number. It's important to talk to the person who has hiring authority or who can at least recommend you as the top candidate for the job. Have a list of references ready in case you are asked for them. Offer information. It’s much easier to make a phone call when you have a reason for calling. You can use your follow-up call as a way to both thank your interviewer and to ask if you can provide them with any further information to help them make a decision. Make a list. Create a short list of what you're going to say, including your key qualifications for the job. Do keep the list brief. You’re going to be making a short and concise phone call rather than engaging in a lengthy discussion. Remind the interviewer of who you are, and of the job for which you applied. Make a match. Mention how you are a perfect fit for the position, highlighting—precisely—why you're a match. Briefly mention the qualifications you have, and tie them to what the employer is seeking. Your elevator pitch, if you have one, can be tweaked to show why you’re an excellent fit for the job. Call in private. You obviously don't want to call from a cubicle at work, but it's also important not to have a lot of background noise if you call from home or somewhere in public. You need to be able to hear, think, and speak clearly, and a quiet spot for the call will make all the difference in the world. Smile. If you project confidence when you call, it will get through to the other end of the phone line. Confident and assured candidates have a better chance of getting a job offer than someone who is nervous and hesitant. Take it a step further. If the conversation goes well, you can even ask when you might expect the company to make a decision. Don't overdo it. Don't call the interviewer multiple times. The employers surveyed by Accountemps definitely didn't want multiple phone calls. This is your one shot at making another good impression, so use it wisely. But don't overuse it. perfect fit for the position, highlighting—specifically—why you're a match. Briefly mention the qualifications you have and tie them to what the employer is seeking. Not comfortable making a phone call? Put it in writing instead. Thank-you notes have a lot of advantages over thank-you calls, beyond the obvious fact that they don’t require you to stammer through a speech. Send one via email, and take advantage of the speedy turnaround time, or send an old-fashioned thank-you note and impress the hiring manager with your dedication. Bottom line: how you say thank you matters less than saying it in the first place. Hiring managers want to hear that you appreciate their time. Make sure they know that you do. How Much Time Should it Take to Get a Job Offer?